Leo Lionni's and Eric Carle's charming children's books often were illustrated with beautiful watercolored drawings. I tried to give these Bo Bunny stamped monsters a similar splotchy, runny look. Using the Misti stamping tool for the accurate placement of images, I stamped the two smaller monsters first, masked them with washi tape and then over stamped with the largest monster. After coloring the monsters with a combination of watercolor pencils and Kuretake watercolors, I fussy cut them and glued on googly eyes. The whitish foreground was achieved with a Bistro white marker. Oh yes, the speech balloon was made with a Paper Smooches die. 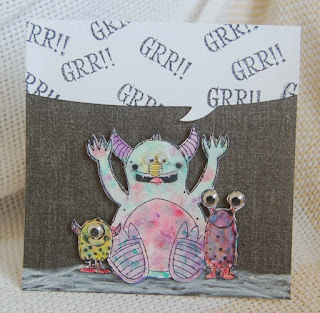 This card is easy and fun to make for Halloween or any occasion ( i.e.use 'Surprise' for birthdays). 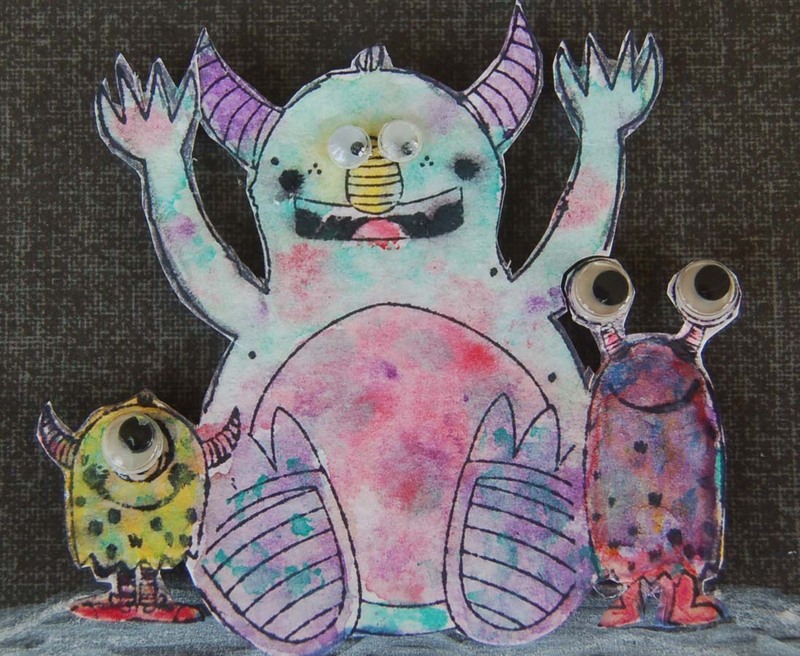 Hope you have a monster of a time crafting Grrrr-eat visions using your magnificently creative brain! 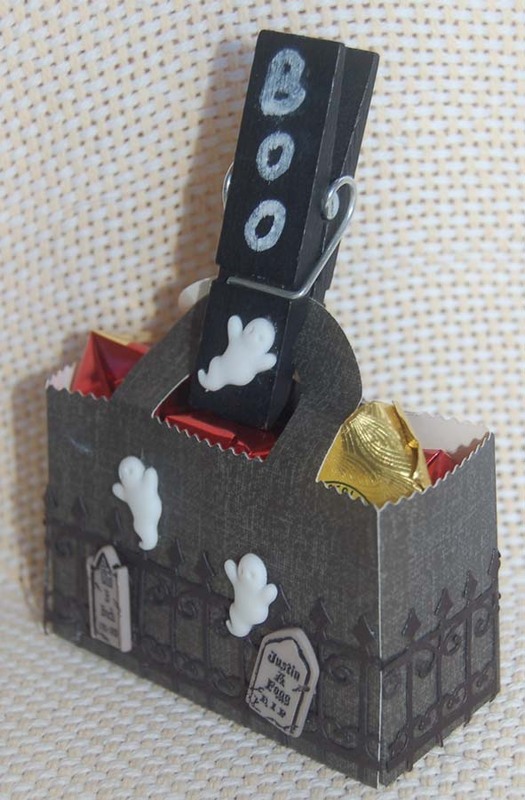 Treat holders for Halloween are my favorite thing to craft even though we are not in a neighborhood with trick-o-treaters. I first saw the Lawn Fawn basket die way back in Easter but felt that it was usable for other occasions, too. Here it is fall already and I'm happily using it for a Halloween treat basket...great for co-workers because of the giant chalkboard erasable clothespin. I wrote 'BOO' (with an erasable Bistro marker) but the recipient's name would be good too. 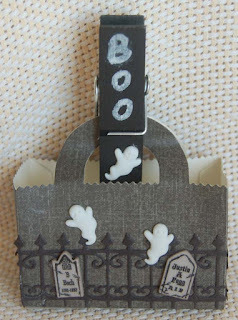 The ghosts and tombstones used are simply Dress It Up buttons (from HM Ben Franklin Crafts) with the shanks snipped off. 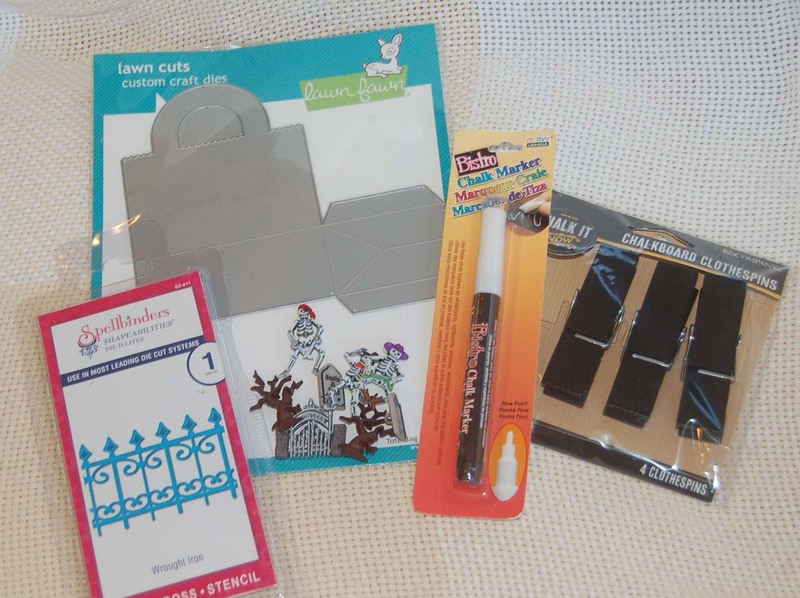 I love the Spellbinders die ( from HM BFC) that cuts the wrought iron fence....so graveyard spooky! I think when I give the Halloween treat baskets I will include colorful tissue or shredded paper to make it more festive. Okay, time to craft more scary stuff! I cut and impressed hexagon pieces that I didn't use on the previously posted card. 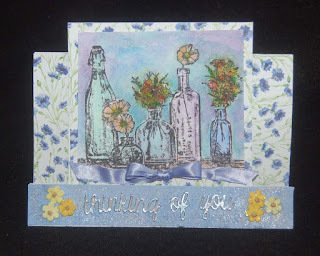 I thought it would be fun to make a mini card and some tags to use them up. This time I used the sentiment, 'What's the Buzz' from a Paper Smooches stamp set. After snipping off the shanks, I glued on some Dress It Up bee buttons (from HM BFC) for a little added interest. 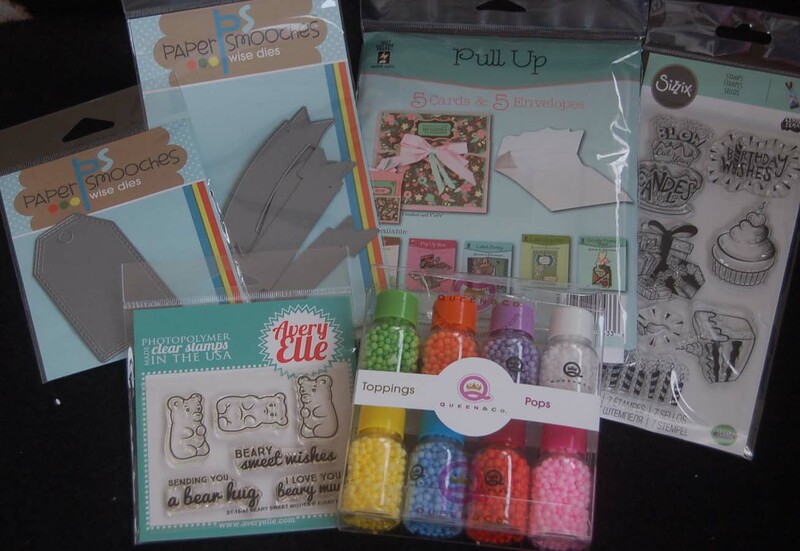 A cute watercolored Rubber Stampede image and some ribbons were attached to finish off these items for my card/tag stash. Shown here is a view of the accordion pleats I added to give the honeycomb tags some dimension. 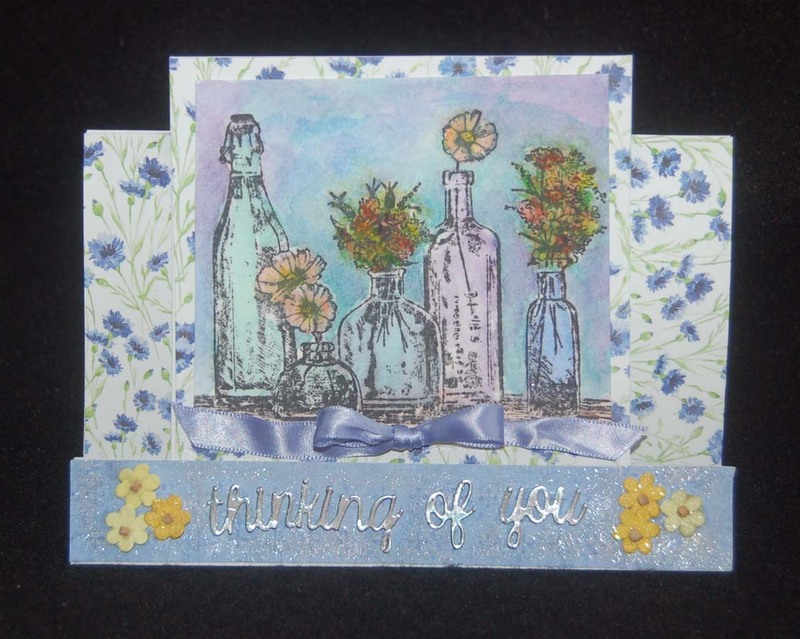 It always makes me happy to be able to use up the little extra bits of scraps leftover from a card making session. My parents always said, "Waste not, want not". I believe wanting for nothing is the true measure of wealth. My husband and I are supporters of the Alan Wong and UHH Adopt a Beehive program. For a donation we have our names on a beehive on the UHH agriculture grounds, receive honey from our hive and give scholarship money to agriculture student. It is a worthwhile program and you should check it out. 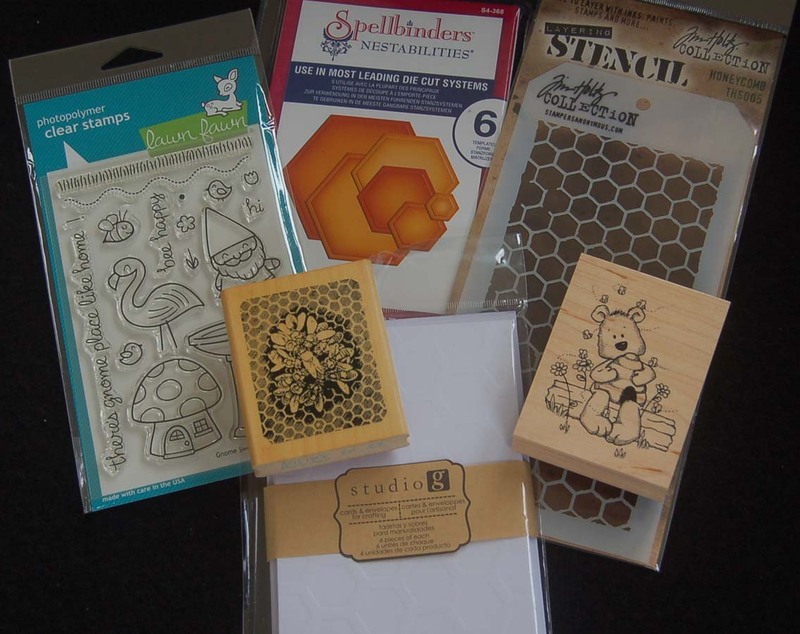 Because of my interest in honey and bees, I have slowly been collecting honeycomb and bee craft supplies. 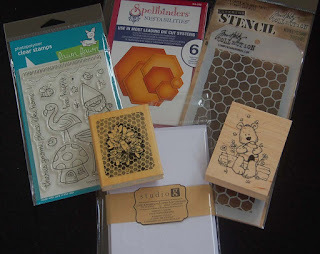 The card base for this project is surprisingly a Studio G card from a $1.50 set I purchased at HM Ben Franklin Crafts because it had an embossed honeycomb pattern. 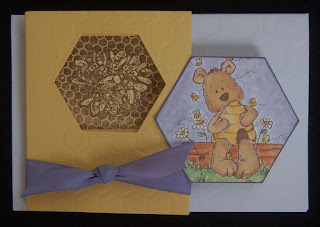 I added a die cut hexagon which was stamped with a Great Impressions honey bear design and colored with Copic pens. 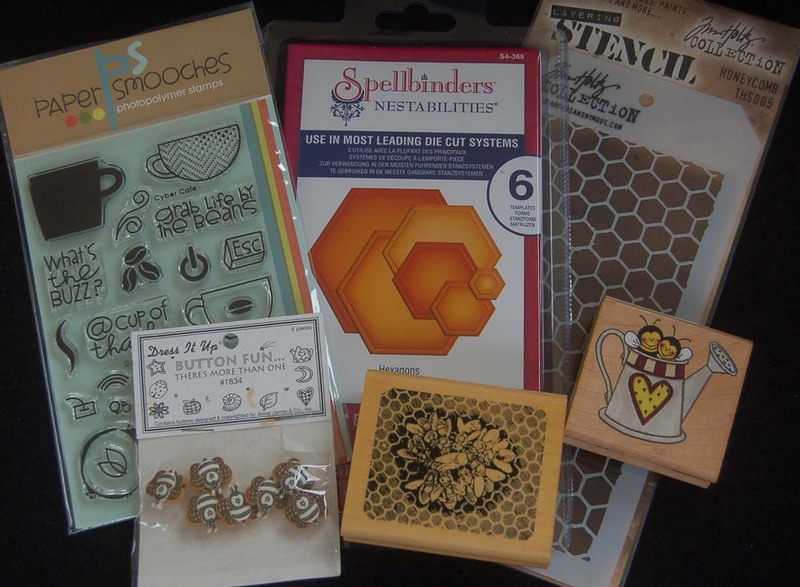 On the yellow panel I used the Tim Holtz stencil and a Big Shot machine to impress a honeycomb design. 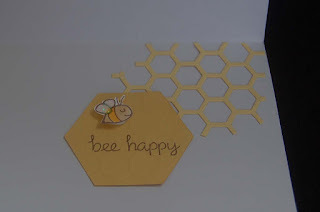 I cut another sized hexagon to make the opening for the stamped bees (Anita's). Oops! I for got to photograph the die I used to cut the lacey hexagon piece I used for the inside of the card. 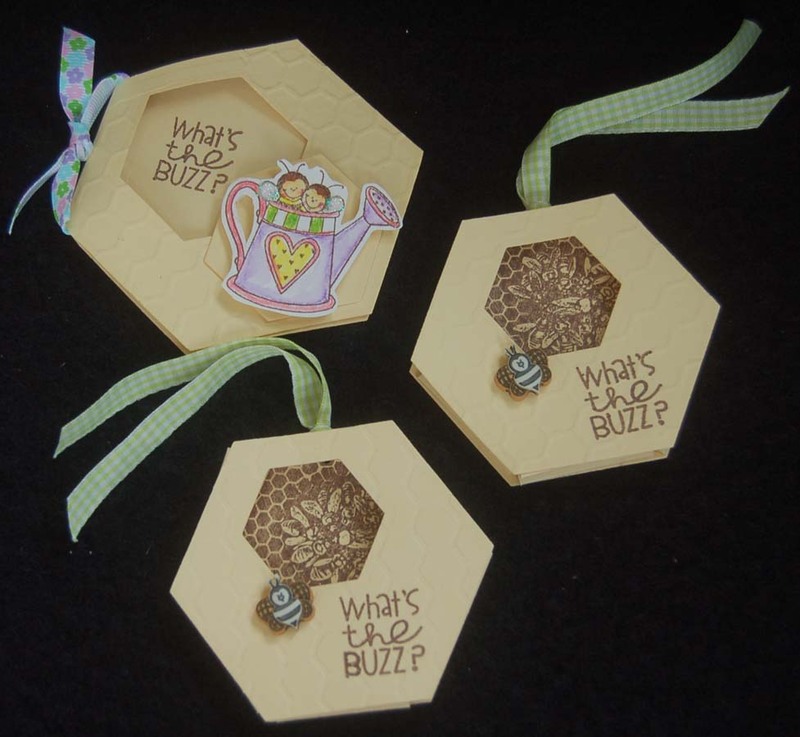 The Lawn Fawn stamp set provided the cute bee image and 'bee happy' sentiment. 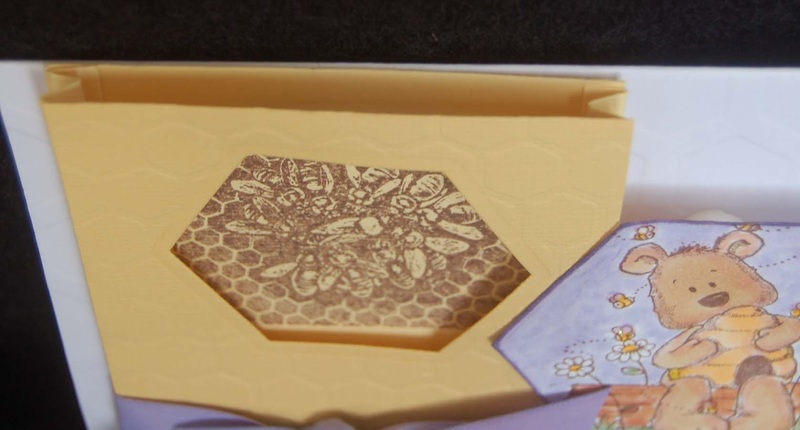 Here is a view of how I used 1" wide strips scored at 1/4" intervals lengthwise to make accordion folds to glue between the front and back of the 'honeycomb'. 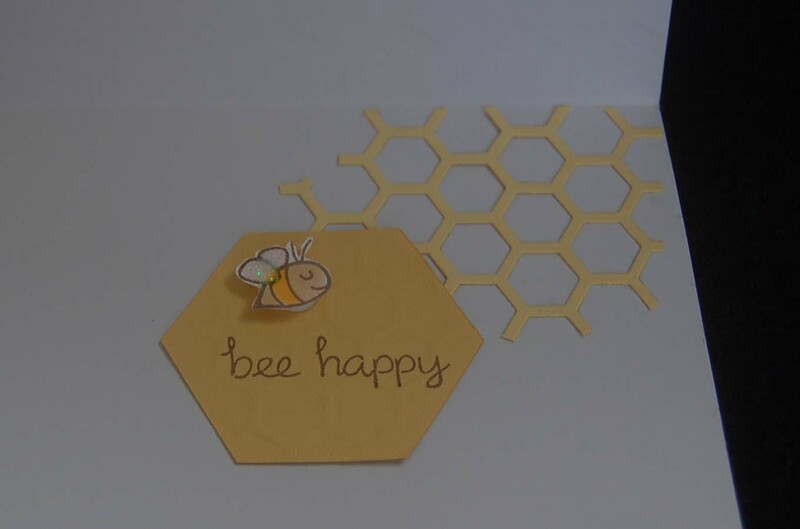 I am very pleased with the outcome of this card because it was easy and incorporated many of my bee themed craft items. Thank you for stopping by and please return again to see how I used the 'leftovers' from this card to make a mini card and some tags. 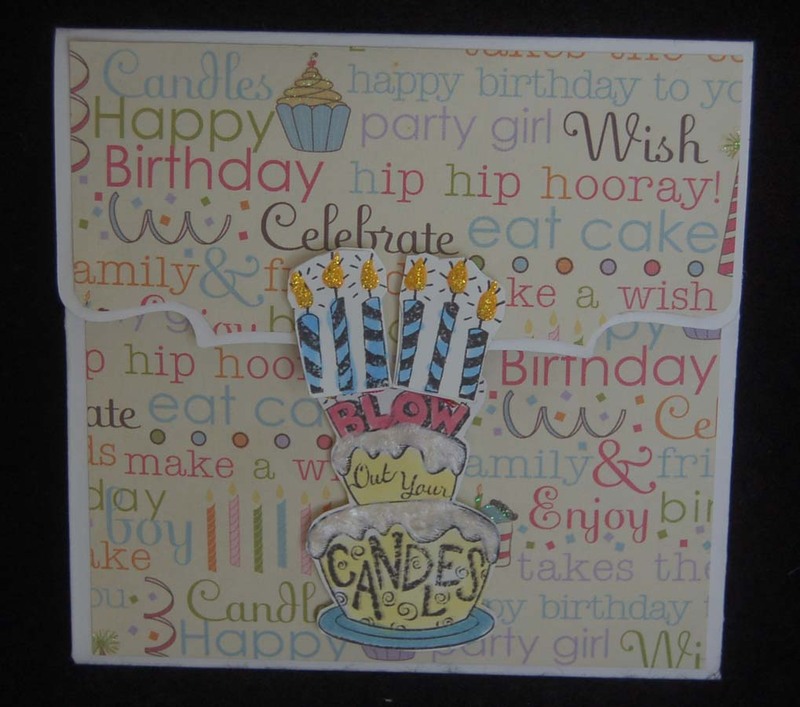 This is another card using a Hot Off the Press pre-made card. This time I used the Center Step version. 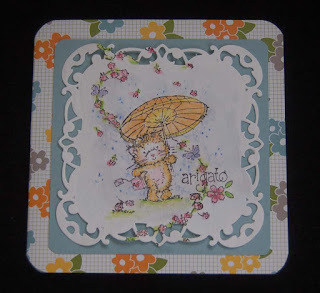 With this card base, it was a snap to watercolor an Inkadinkado image (stamped on watercolor paper) to use on the front along with Bo Bunny floral card stock from a 6x6 paper pad. Here is a side view of the card which shows just how easily it sets up. 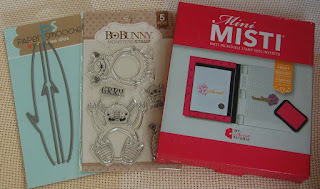 The words were die cut from silver foil paper using a Sizzix die. I like that this pre-made card allows me to concentrate on watercoloring, a skill which I am eager to learn. Well, that's it for now...hope you had fun taking a look at my crafting addiction. The completion of these cards really made me happy because they turned out almost exactly as I had imagined them. Don't you love it when that happens? 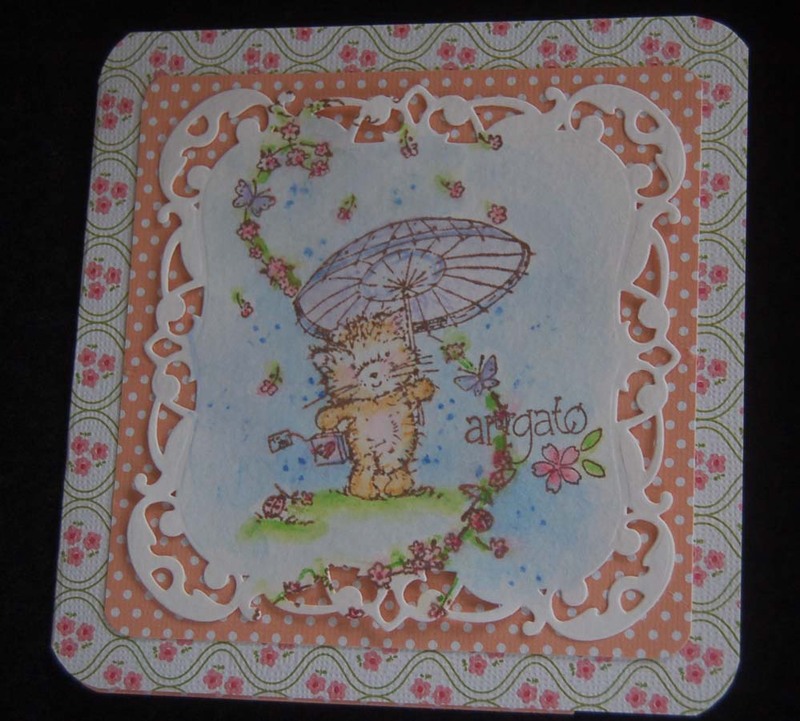 Not only that, but each card required only one 12x12 double-sided card stock....including the inside parts but not the white square doily watercolored piece. 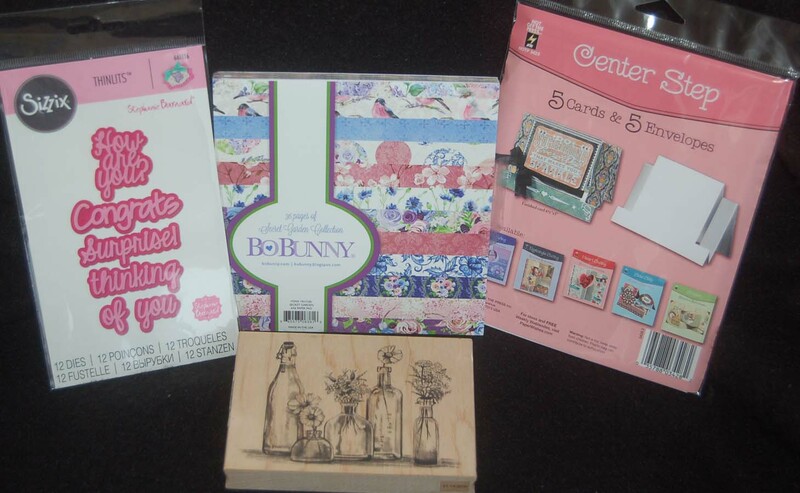 The beautiful square doily was cut with a Spellbinders die from a set (of 4) that was incredibly on sale at the Hilo Ben Franklin Crafts for 75%off! You really should check out the pink tagged items in the clearance aisle of HM BFC. I used lightweight watercolor paper that cut easily, stamped nicely with Memento ink, and colored quickly with watercolor pencils and an Aqua pen. Here is the inside of one of the cards. 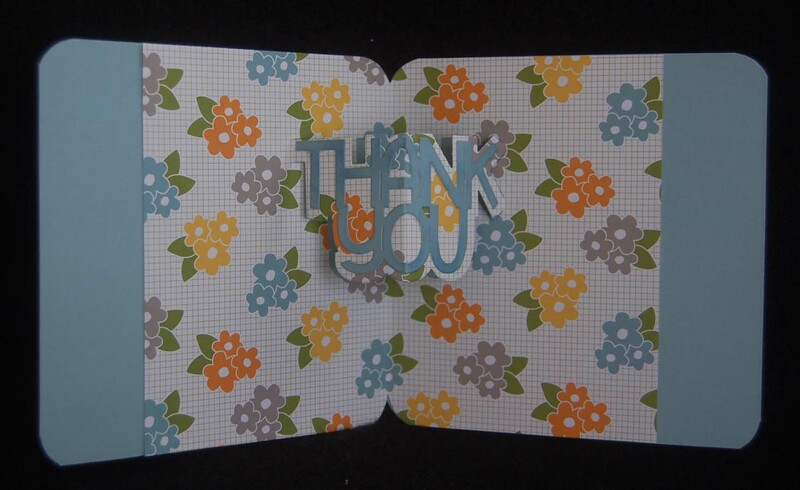 I was pleased that there was even enough card stock to die cut the pop-out 'thank you' using the Sizzix set so everything color coordinated well. 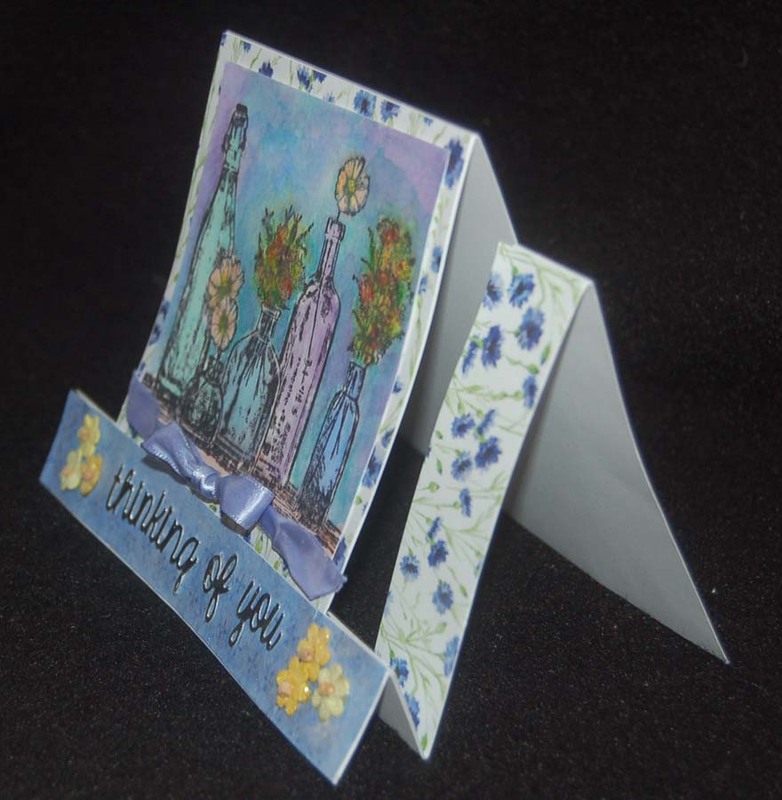 The We R Memory Keepers corner rounder tool added just the right finishing touch. 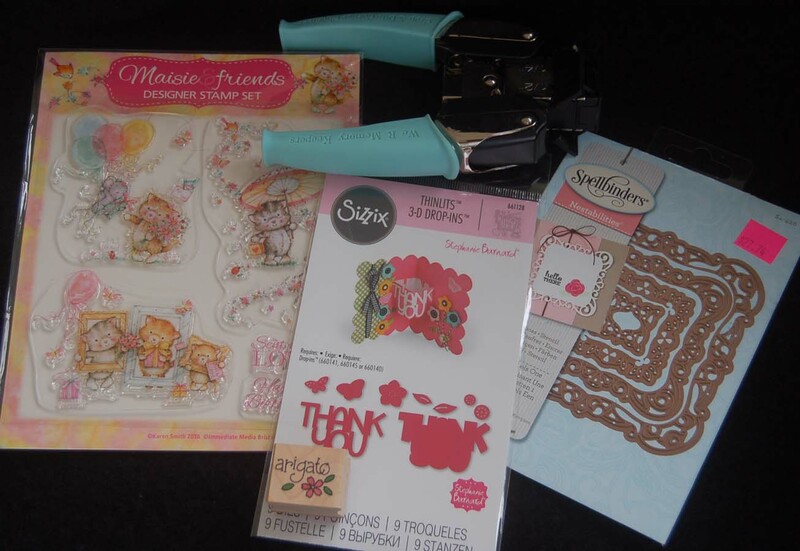 The Massie & friends stamp set came with a craft magazine, but there are lots of stamps at HM Ben Franklin Crafts which would work in this card layout. 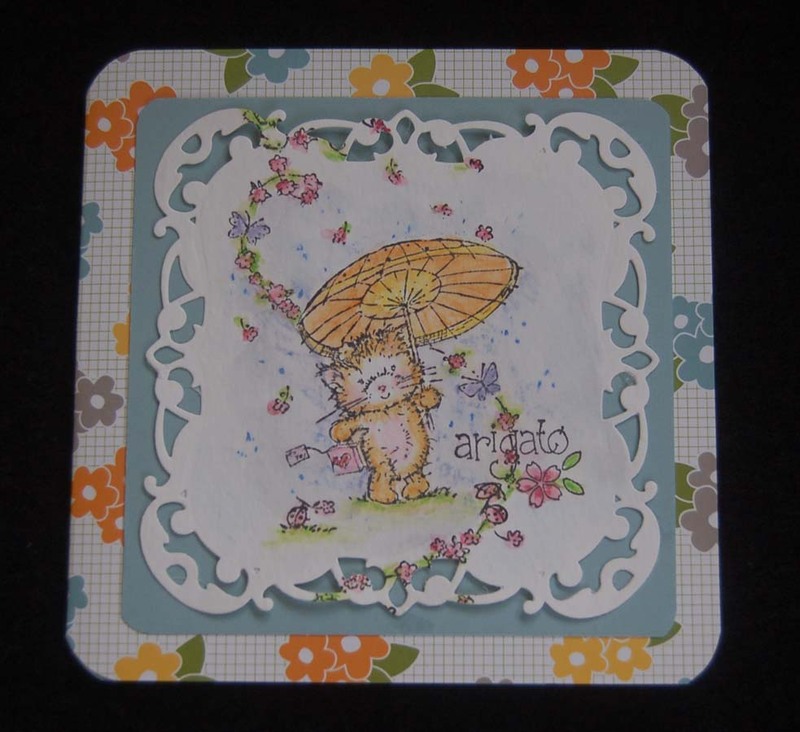 Finally, the 'arigato' stamped next to the kitten was done with a wooden stamp which I've had for awhile and doesn't have a makers mark, but I think it is a Dandelion Design stamp. Hope you've enjoyed your visit to this blog site. Please return often and leave a comment if you want to send me a smile. 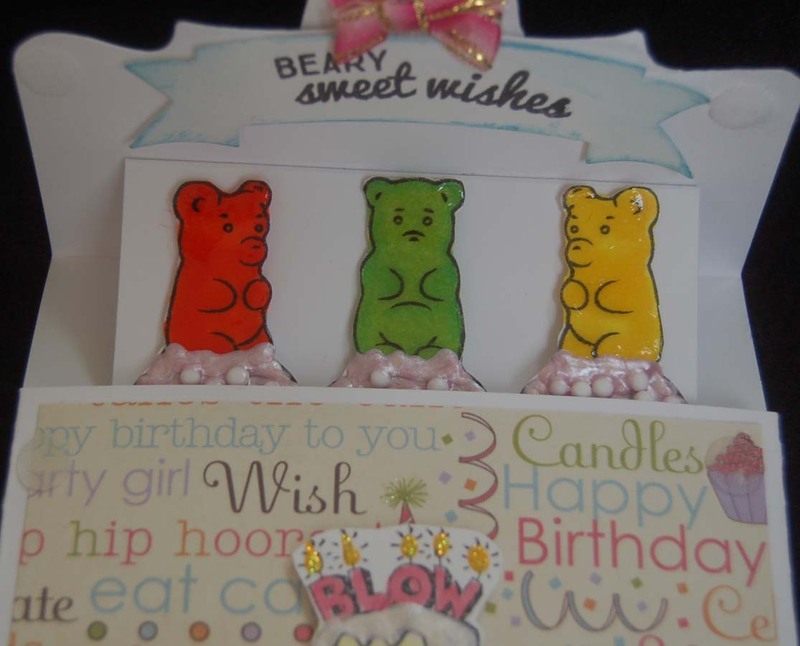 For this card I wanted to use both the Sizzix birthday stamp set and the Avery Elle gummi bear stamp set on a pre-made Hot Off the Press pull-up card that I purchased from HM Ben Franklin Crafts. I like the time that I saved by not having to make the card base. 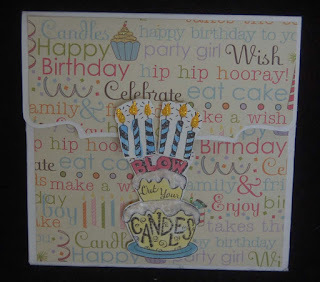 It was easy to apply a birthday print paper to the front of the card (I hand cut the the wavy flap.) and then use foam dots to adhere the stamped birthday images. 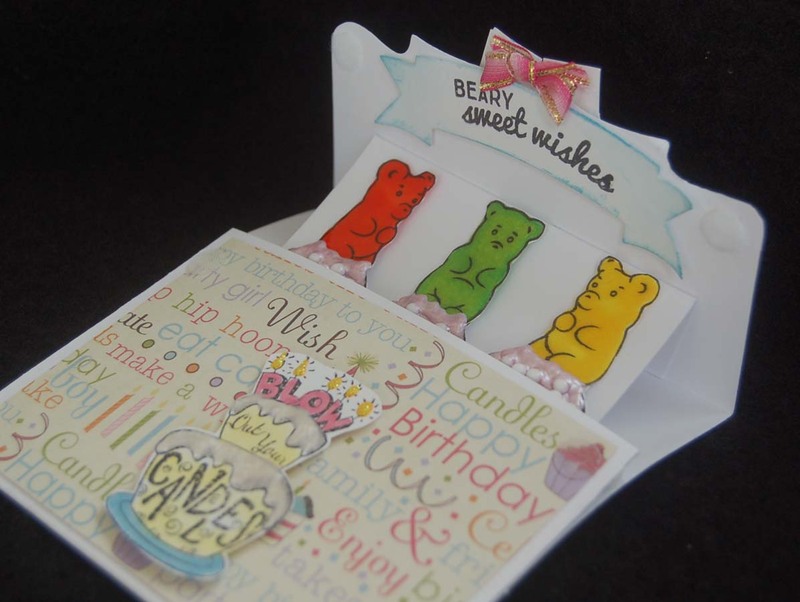 Velcro dots were applied to the corners of the flap to keep the card closed until the surprise reveal of the yummy gummi bears. These gummi bears were colored with Copic pens (for an intense color) instead of colored pencils because the bleed through on the backs of the bears does not show. 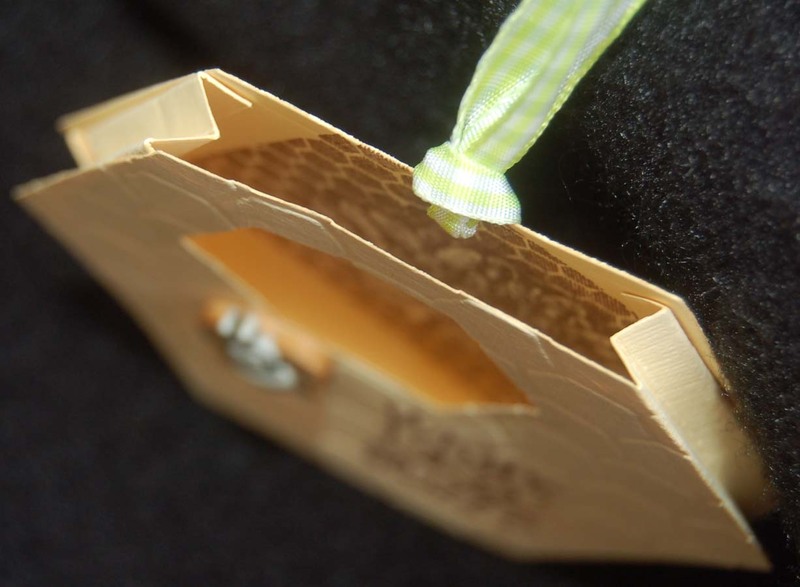 A bow was glued on the top of the inside to cover the back of the candle image. The banner was cut with a Paper Smooches die and stamped with the gummi bear sentiment. Oh, I forgot to show the Bo Bunny pearlescent pink paint that I used to 'frost' the cupcakes...love the texture with the Queen and Co. foam balls added on top. 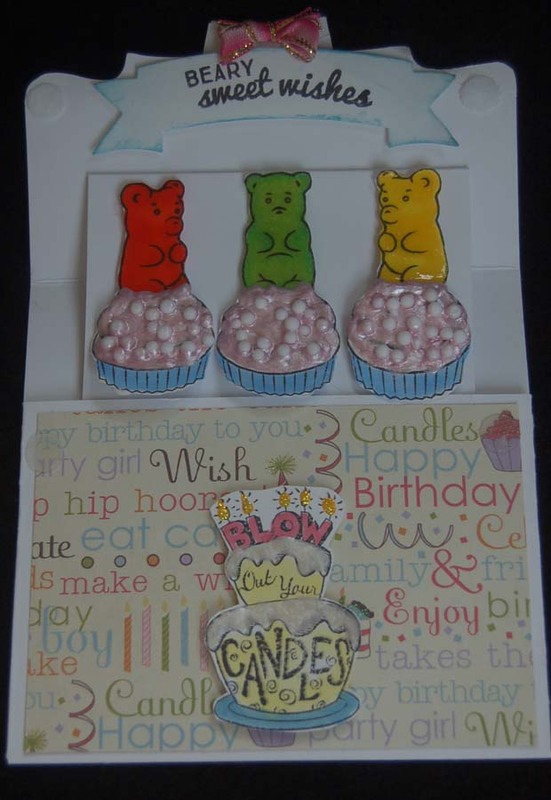 I am happy with the finished card because the front is unassuming and the recipient will get a sweet surprise when the gummi bears pop up. I love interactive cards! Thanks for visiting this blog site. Leave a comment if you have time to spare. I truly enjoy reading them.